The film shook us with its powerful and unique story. It brings us right into the middle of the slums of Manila and to a woman with a very special job. We are particularly impressed by the strong and authentic performance of the main actress Ruby Ruiz. She faces her situation with morbid humour and dignity. The precise and creative camerawork and direction lets us immerse into this powerful work of art. A visually stunning documentary short film, which takes us to a dramatic scenario into a steep Swiss forest. We were impressed by the beautiful camera work and how this old tradition of log driving is kept alive. A powerful and breathtaking short film that makes us reflect about police violence. This conceptual film uses footage that was found from every police shooting over the last two years in the United States for which there is available video. The superimposed pictures and sounds create a terrifying experience that leaves a lasting impression. The Raskin Spirit Festival Award Overarching the two main competitions, and selected by the festival team. Established to celebrate the unique qualities of a compact, poetic short film that make use of the visual and auditive possibilities in an imaginative way, and do not follow the traditional feature film dramaturgy. The jury was impressed with the visually beautiful scenes, the sound design, acting and poetry in this film. This poetry is juxtaposed with an encounter with the rough reality of racism hidden behind a message of tolerance which makes the glass ceiling even more hurtful for the protagonists of the film. Through a small random encounter, the director intelligently shows us how No man is an Island. The jury appreciates the director's bold take on families and fantasies with a sense of dark humour and great actors. As a young woman moves back in with her aging parents, conscious and subconscious dreams melt with nightmares in a disturbing portrait of a suburban family that sticks with the jury. The jury enjoyed the metaphorical journey through a modern day divorce. Olavi, on the brink of divorce, retreats to his cabin only to find that the ceiling has come down and he literally is not able to stand up straight anymore. The metaphor gives room for reflections about what is real and what might be a mirage, but things seem to get back on track when the protagonist finally stands up for himself. The jury appreciates the detailed handcraft and the absurd mixing of stop motion animation and musical in a somewhat ludicrous universe where fishes can sing. The jury appreciated the empowering and comforting ending for us in this universe, which leaves us with some hope. We were touched by the story told sincerely from the heart dealing with difficult questions as identity, home and family. The film tells the story of Kurdish Shwan Dlar Qardaki that escapes war ridden Iraq in search of a new life in Europe. But the escape becomes more complicated than just the journey itself. What has he had to leave behind? What prices has he had to pay to come to Norway? How can he find his peace when a lot of his family members still live close to the front lines of a war. The film shows the leap of faith that Qardaki has had to make to embrace his new life, and the jury was moved by the story. The jury could not resist the protagonist as a personality in distress and the way the actress performed it. Kristine Thorp makes an impressive interpretation of a character that is trying to find her way through what she finds as a superficial start-up week at university. She searches for roots and deeper relationships as she moves back to her hometown and makes her way into a new stage of her life. The jury was charmed with this animation film that shows the challenges of falling in love when the protagonist is preoccupied with escaping his fears. But with a surprising twist the film elegantly finds a solution to what turns out to be a simple problem. The film is warm, humorous and charmed the jury. Jury: Beth Sá Freire [BRA], Sari Volanen [FIN], Igor Devold [NOR]. 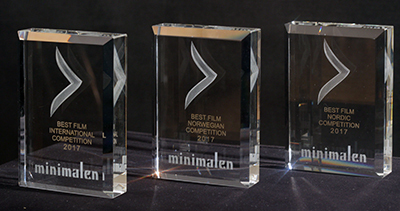 Best Norwegian Prerunner - To be screened before a feature film at Trondheim kino for one month, selected by Trondheim kino. (In Norwegian:) En kompakt, underfundig og morsom historie med viktig tema. Filmen får en ny og større betydning etter at #metoo ble satt på kartet. Assosiasjonene går til hva kvinner bærer over med hos (selvgode og arrogante) menn, og at begeret til slutt renner over. Filmens innhold er tilgjengelig og gjenkjennelig, noe vi synes er viktige egenskaper for en forfilm.